What does today’s consumer want? They want to see houses AND they want to search a little on their own before setting an appointment with an agent. In other words, they want to search like an agent without first engaging an agent. Once they get a good idea of what the market offers either to buy or what their competition is to sell, then they want an agent! So what if you could provide the consumer with EXACTLY what they want AND then have YOUR contact information literally at their fingertips the moment they decide to contact an agent…. well now you can! 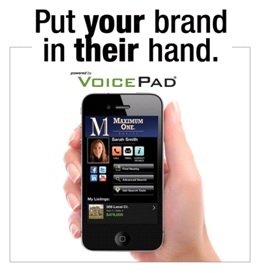 VoicePad has Maximum One agent-branded mobile websites! This will get you more SELLERS and BUYERS! Call CaptureThe VoicePad mobile strategy begins with our professional-grade Audio Presentations, which are automatically assembled and updated from a brokerage’s listing data-in both English and Spanish-for all active listings. It’s how we guarantee potential home buyers can obtain information on ANY home, from ANY phone. TextConsumers can call or send a text to the same phone number-No short code required! Brokers easily create and manage text keywords and automated responses from the VoicePad dashboard. Mobile Web – GPS Mobile IDX Agent SiteText links generated from the VoicePad audio/text platform direct home buyers to an Agent-branded Mobile IDX Site-the world’s first mobile websites to include tours with audio-or photos, interactive maps, and online searches. As a licensed agent, you conduct real estate business in the name of a Broker. The Broker, therefore, needs copies of all documents related to your real estate transactions. The easiest way to think about it is anytime there is a document involved in a real estate transaction that has your signature or a co-op agent’s signature or a public person’s signature on it, the Broker needs a copy. Remember too that License Law requires that your client / customer also gets a copy of anything they sign. In the past, agents simply turned in their paperwork into the office! In today’s digital age, agents “turn in” their paperwork electronically to some transaction management system. At Maximum One, that system is Paperless Pipeline. When you initiate a new transaction (listing, contract, Buyer Brokerage, referral, lease, customer, etc.) you upload that into Paperless Pipeline and “Start a Transaction.” When you do this, the Compliance Broker will process that and then next time you go into that transaction, you will see a Checklist to the left of Agent responsibilities and Broker responsibilities. 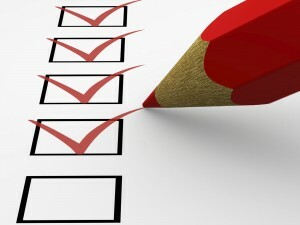 Below are checklists for your convenience of the required paperwork that the Broker needs for your transactions. These are for you convenience and designed for you to print one out & attach it or keep it electronically with your file to assist in your paperwork management. These are also on the Extranet and in Paperless Pipeline under the “Office” tab.